Yeah, I don't think many really needed the poster to confirm what was going to happen on Sunday. too bad, some of the guys in there (cesaro) could have really used the title. i still think they should split it, have 2 guys pull the belts away at the same time would be fair enough. Yeah... splitting it so soon after unifying it would be a mistake. This is unsurprising... but upsetting all the same. I mean, leaked posters have never been sure-fire indicators of what's going to happen. 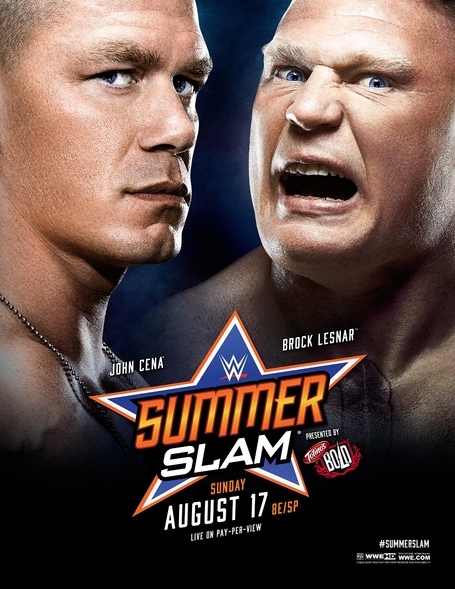 But I think it's fairly obvious Cena's going to win anyway. I'd be surprised if anyone else won at this point. Awesome! Cena works hard and deserves this. As a shareholder (yes I didn't sell when it was at $31, now its down to $12, after I paid $14 a share ) I know this is best for bussiness. As much as everyone thinks its Orton or Kane's time, I think its time for WWE to pull the trigger on the Cena machine! kingofswing wrote: Awesome! Cena works hard and deserves this. Is this sarcasm? I am bad at reading these things on the intertubes. i was going to say the same, ORTON OR KANE?!?!? Kane doesent deserve anything and orton WAS ON VACATION. If anything any of the other 5 guys winning would have been best for buisness, allowing a newer guy (cesaro, reigns, wyatt) a big boost, which after the last couple months, they have earned. Allllsssooo. Unless we don't know something, you don't have adequate shares to actually influence the company, so that was a bad move on your part and super irrelevant to the discussion. Sell shares after Mania like Indy suggested. Yeah, the wwe stock seems pretty easy to predict. Buy in June, Sell right after mania. I will give him/her this, It seemed as if Kingofswing was saying that as someone who has a financial interest in the companies success, they are happy to see the belt on cena. I almost read it as an attempt to excuse the rest of the comment.